In recent weeks a number of samples have come into our office of lettuce plants that have the following symptoms: stunting, yellowing outer leaves and occasionally with wilting during the afternoon (Photo 1). 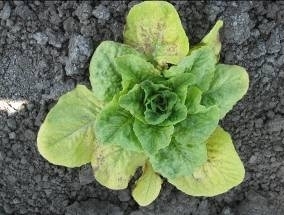 The symptoms superficially resemble Lettuce Dieback caused by Tomato Bushy Stunt Virus, but Steve Koike has not detected this virus in these plants. 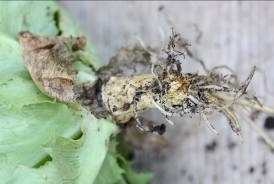 Affected plants also typically have roots that are no longer than 1.5 to 2.0 inches long (Photo 2). Upon careful examination of the root tissue, it can be seen that the roots once extended further, but were burned off at this point in the soil. The death of the tip of the root was not caused by a disease. In nearly all cases that I have seen so far, this problem occurs on heavier clay loam to clay type soils. Based on the uniformity of the depth of the point of death of the tap root, it appeared that this problem was associated with an application of fertilizer. Given that fertilizer is a salt, it is capable of damaging young root tissue. 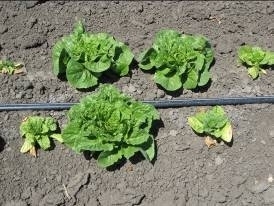 These symptoms are distinct from ammonium toxicity which damages lettuce root tissue by the toxic action of the ammonium on root tissue (see Blog entry April 26 by Steve Koike). 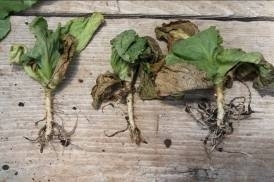 Ammonium toxicity causes distinct symptoms on affected roots; however, these symptoms are distinct and appear to be caused simply by salt burn of fertilizer. (Photo 3). To confirm this hypothesis, last summer I worked with a cooperating grower to recreate these symptoms on lettuce. I used a pipette to inject fertilizer 0.5, 1.0 and 2.0 inches from the base of lettuce plants, and 1.5 inches deep in the soil; all applications were applied at the thinning stage. We observed that there were higher levels of plants with the tap root burned off in the plots where the fertilizer was applied 0.5 inch from the plant than farther from the plant. These results are not surprising, but the question is why do these symptoms occur at all? Tractor applied fertilizer is spaced 2-3 inches from the plant to avoid fertilizer burn. One possible explanation on how the fertilizer may reach the lettuce roots has to do with soil type. As I mentioned the problem seems to occur on heavier soils; these soils are more prone cracking which can permit liquid fertilizers to flow a short distance towards the seedline during the application. If the material flows close enough to the taproot of the young plant, then it can burn the tap root at the level of injection in the soil. This explanation may explain why the problem occurs at more or less a uniform depth in the soil and why affected plants are scattered in the field (e.g. scattered plants or 2-3 affected plants next to healthy plants) (Photo 4).